Whatever your firewood needs, we can accommodate you, our customer! We can deliver to your location or load firewood at our facility in any quantity that meets your needs. Just ask and we will do our very best to exceed your expectations. 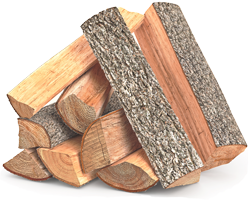 Restaurants: We can supply USDA Certified kiln-dried hardwood firewood, split smaller for typical pizza oven or wood-fired grills. This wood burns hot and is extremely clean and dry. Arrangements can be made to deliver and stack this wood at your establishment. Residential or Commercial Smokers: We have oaks, hickory, cherry and pecan wood available. Call today to place your order. State Parks, National Parks, Campgrounds: We can manufacture, dry and wrap USDA Certified kiln-dried hardwood firewood in the typical .75 cuft. bundles and deliver in bulk to your location. No order too large. Our USDA shield ensures that all State and Federal regulations are being exceeded and that our wood is free from harmful pests/bugs. Residential Customer: We can deliver a full cord + of seasoned or USDA Certified kiln-dried hardwood firewood to your location year round. The wood is tumbled multiple times to ensure you receive the highest quality, cleanest firewood available. Ask about our specials if you order 2+ cords at any one time. We also typically have specials if you purchase green wood in the spring/summer months. Firewood is always available for pickup at our Moncure – Pittsboro location. We offer several load sizes to fulfill the smallest to the largest requests. We desire to meet every firewood need of the residential and commercial customer within the Southeastern United States. Whether you are a residential firewood user, a campground or State/National Park, or even a large commercial retailer, East Coast Firewood has the raw material, the equipment and the professionals to deliver only the highest quality hardwood firewood to your location, with exceptional customer service. View our popular firewood load options below. Contact us today for a quote on pricing, delivery options, and additional services we offer. We look forward to earning your business. We can load any size car, truck or trailer at our facility. Call us to learn more about our firewood products and your firewood delivery options.